The $20 kit is customizable, just like Nintendo Labo. Earlier this year, Nintendo launched its Nintendo Labo building kits, letting kids and adults construct special Switch controllers out of cardboard. Other companies jumped on the cardboard bandwagon, releasing things like a cardboard guitar and a small cardboard arcade cabinet. Video game accessory maker Nyko revealed its own cardboard building kit, called the PixelQuest Arcade Kit. 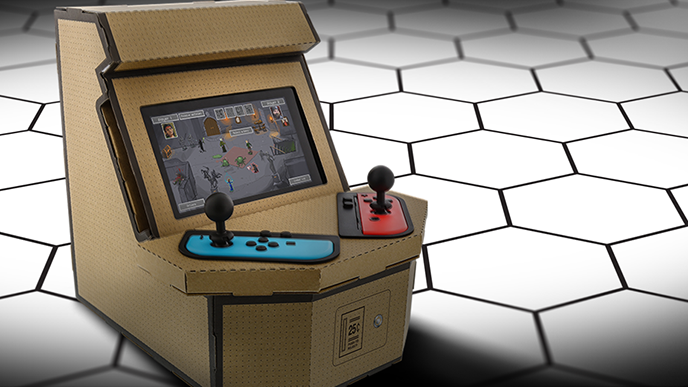 It will let users create a large tabletop arcade cabinet out of cardboard, which uses the Switch as the cabinet’s screen and the two Joy-Cons as the joysticks. As Engadget reported, the cabinet will let you play any game that requires a single Joy-Con, and two people can play games at once. The PixelQuest Arcade Kit will come with two plastic joysticks that attach to the Joy-Cons for extra realism. There’s also a coin slot at the bottom of the cabinet that works like a piggy bank. When your and your kids are done building the cabinet, your little ones can go to town decorating the cardboard with the included pixel block stickers, or with any markers, stickers, and other goodies you have around the house. The PixelQuest Arcade Kit is expected to launch this fall for $19.99.